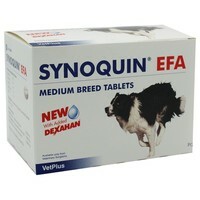 Synoquin EFA Joint Supplement Medium Breed is a nutritional supplement that encourages the growth and maintenance of cartilage and healthy joint formation. It offers an effective alternative to more traditional drugs for dogs suffering from arthritis. Synoquin EFA provides the essential nutrients which dogs may not receive from their daily diet that are the key building blocks to the development of healthy cartilage and supple joints. Specially formulated with the added ingredient Dexahan (a highly purified form of Krill), Synoquin EFA is more efficient than regular fish oils as it is much more easily absorbed. Key ingredients, such as the naturally occurring Chondroitin and Glucosamine, provide support to the repair and maintenance of joints, allowing dogs to keep active and improve overall health and well-being. Suitable for dogs weighing between 10-25kg.